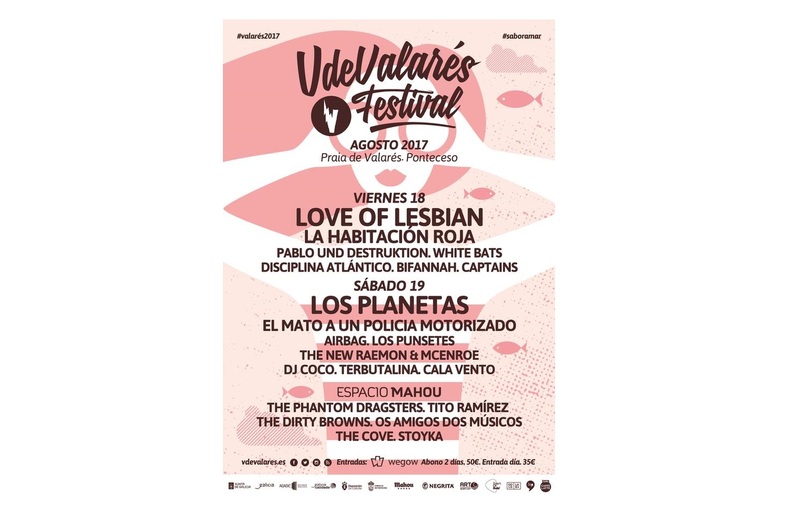 The festival “V de Valarés”, which this year reaches its eleventh edition, will be held on 18th and 19th August at the beach of Balarés (Ponteceso), making it the place with the best music and entertainment in Galicia. This is an independent music festival that, year after year, surprises us with a solid line-up full of renowned national and international names. For their two scenarios, this year we will be able to see (and listen to) groups like Love of Lesbian, La Habitación Roja, The New Raemon & McEnroe or Los Planetas, although the true headliner is undoubtedly the place where is carried out. It is located at the foot of Monte Blanco, the beach of Balarés has the charm of the paradisiacal coves of white sand and is surrounded by a huge pine forest that shelters the campers every year. This festival was born in 2004 thanks to a group of friends who gathered the night of San Juan on the beach with a small stereo that accompanied the bonfires. That first night grew in assistance and activities until it became an alternative for the young people of the zone. From its beginnings, the festival counted on artists who contributed making a mountain out of a molehill to make it grow and, year after year, has been consolidated like a meeting point for the lovers of the music and the nature. All of them enjoy in a spectacular setting. It is also worth mentioning that the V de Valarés stands out for its enormous commitment to the environment. That is why, both festival producers and attendees, must abide by a number of environmental standards and develop activities with an awareness of respect for nature. Thus the festival provides recycling bins and is responsible for selective collection, uses renewable energy and has official recyclable glasses that are delivered to attendees, reducing by 75% the waste of drink. In addition, a team of more than 50 people collaborates voluntarily in the cleaning and maintenance of the festival area. Friday 18: Love of Lesbian, La Habitación Roja, Pablo und Destruktion, White Bats, Disciplina Atlántico, Bifannah and Captains. Saturday 19: Los Planetas, Él Mató a un Policía Motorizado, Airbag, Los Punsetes, The New Raemon & McEnroe, DJ Coco, Terbutalina and Cala Vento. In addition, in Mahou Space, will perform The Phantom Dragsters, Tito Ramírez, The Dirty Browns, Os Amigos dos Músicos, The Cove and Stoyka. If you are convinced and finally decide to attend, be prepared for two days full of energy, laughter and good experiences in an incredible atmosphere.